Headed on a cruise with a port call in Key West, FL? 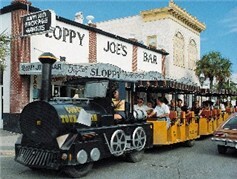 Then check out our pedestrian friendly story by Key West resident and journalist Laura Myers. Laura gives cruisers insight into what attractions and activities are good for families. Among them is a new Eco-Discovery Center on the island. So come along with Laura as we explore the best of Key West if you have kids in tow! Did you know that Key West -- while at land's end in the Florida Keys -- is not the most westward Keys destination? Seventy miles into the Gulf of Mexico is the Dry Tortugas group of uninhabited islands. The far-flungislands are called "Dry" because they have no potable water. 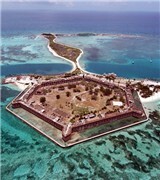 While part of the Keys chain, the Dry Tortugas actually are closer to Cuba than they are to Key West. In the mid-1800s the United States government built Fort Jefferson, a massive structure with 16 million bricks, atop one of the tiny islands -- totally covering it. Today, ocean waters lap at the sides of the fort, but it's survived many hurricanes. If your cruise itinerary includes a long, full day in Key West, ask your cruise line if it offers such a shore trip. In case you are able to fit in this excursion, our freelance writer in the Keys, Laura Myers details what you'll see. She visited Fort Jefferson on a seaplane ride a few months ago.